While there are terrific measurable benefits reaped by the use of wind energy, the simple fact remains: all energy sources, alternative and renewable among them, have some impact on the environment. In the case of wind power, the turbines put flying animals at risk. The creatures are killed in two ways, bird fatalities are caused by impact with the blades. With bats the pressure wave from the turning blades hits the bats, and damages their internal organs. An Oregon State research team led by associate professor of mechanical engineering, Dr. Roberto Albertani aims to see what can be done to prevent this. The project, “Remote Monitoring of Avian and Bat Interactions with Offshore Wind Energy Facilities,” involves the design, deployment and testing of an integrated onboard sensor array that monitors for avian and bat interactions, and then transmit post-strike images and data for analysis. The sensor is designed to detect a strike as well as provide taxonomic classification of the animal involved in the collision. The research is funded by U.S. Department of Energy, and according to Dr. Albertani, the research is part of a larger study on the possible risks to birds and bats from wind energy development, including reduction in habitat, disruption of migratory pathways, injury and death through collision, and injury and death from eddy currents in the wake of revolving wind turbine blades. Albertani’s research is especially important for birds that are an endangered species. Meanwhile, operators of offshore wind farms will have an increasing interest in technology that can reduce incidents of impact, as the investment into wind facilities expands, and the data on bird deaths collects. Power companies have faced hefty fines for activities that endanger animal life. BP was fined $100 million for harming and killing migratory birds in the 2010 Gulf Spill. Western power utility Pacificorp was fined more than $10 million dollars in 2009 for electrocuting 232 eagles along power lines and substations. 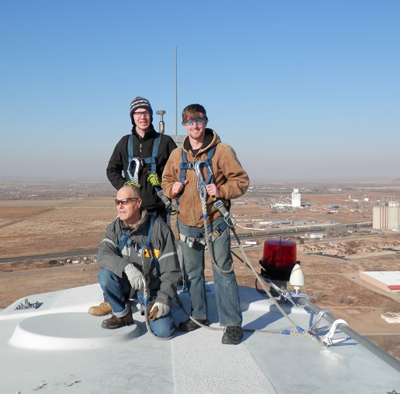 Dr. Roberto Albertani with graduate students Jeremy Flowers and Josh Wilcox (l to r) atop the wind turbine at the North American Wind Research and Training Center at the Mesalands Community College in Tucumcari, New Mexico. In November 2013, power company Duke Energy was fined $1 million for killing 14 golden eagles, a protected species, and about 150 other birds on two wind farms in Wyoming. This was the first enforcement of federal bird protection laws against a wind energy facility. Albertani’s research could lead to commercial strike-detection equipment, and such technology could be helpful for offshore wind to avoid harming and killing birds, as well as avoid the costly fines. “By understanding the current and potential environmental issues associated with offshore wind, we can try to minimize these impacts and better support the development of sustainable energy sources,” Albertani said. The bird-blade impact tests for the offshore wind energy facilities project took place in a curious location – the arid spaces in the middle of New Mexico. The North American Wind Research and Training Center at the Mesalands Community College (MCC) in Tucumcari, New Mexico, has an operational wind turbine, and it part of the collaborative research effort with Oregon State. The turbine and other facilities at the wind center are used to train MCC students to become qualified wind energy technicians, but to also contribute to research of wind energy technology. Albertani notes that carcass collection, a common method for gathering data on animals in the terrestrial setting, is quite inefficient in the offshore marine environment. There are two endangered seabirds in the Pacific Northwest, the marbled murrelet and the short-tailed albatross, which could be harmed by increased presence of offshore wind power facilities in the region. The affected species of bats are not endangered. With graduate students, Jeremy Flowers and Josh Wilcox, the researchers used tennis balls to mimic bird strikes; with the initial “strike data” the team can investigate the mathematics needed to develop a bird-security system. If a turbine could recognize when it is hit by a bird, it could slow down or stop to minimize risks to other birds in the area. Not only will this save birds, it will reduce some business risks associated with the environment for offshore wind energy development. The Golden Field Office, funders of the research, supports DOE’s Office of Energy Efficiency and Renewable Energy (EERE) in the development and commercialization renewable energy and energy-efficient technologies. Other team members include Robert Suryan (Oregon State Hatfield Marine Center), Brian Polagye and Trevor Harrison (Northwest National Marine Renewable Energy Center, University of Washington, Seattle) and the National Renewable Lab (NREL).